Home to one of the greatest VIP programs we’ve ever come across, PlayClub is an online casino that’s built an name for itself. It was only a matter of time before we decided to treat you to a full review on PlayClub. This casino is powered by Aspire Global, one of the leading providers of iGaming solutions in Europe. With more than 50 iGaming brands and counting, it’s no wonder that PlayClub is such a remarkable casino. They’re fully licensed by the MGA (Malta Gaming Authorities). MGA is one of Europe’s biggest gaming authorities. Thanks to the MGA’s outstanding reputation, we know that any casino operating under their authority is 100% trustworthy and reliable. PlayClub has been available for a while now, so it was time to put them to the test. As usual, we’ve checked out their registration process, game variety, payment methods and much more. When first checking out PlayClub, we definitely got a bit of a “VIP” vibe. The prominent colours are different shades of grey, with a pop of blue. We love the balance between muted and bright colours. It makes the site look inviting and easy on the eye. Opening an account is easy as pie, and should only take a minute of your time. Fill in your email address, username and password in step 1, and fill in your personal details in step 2. PlayClub is a multi-currency casino (hooray! ), offering players the possibility to play in EUR, AUD, CAD, GBP, NOK, SEK, and USD. You can select your preferred currency in the second step of the sign-up form. By far one of the most important attributes to any online casino is their game variety. Thankfully, PlayClub does not disappoint. 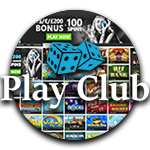 PlayClub offers games in three major categories: Casino, Live Casino and Scratchcards – all of which are displayed at the top of the website. The games you can find in these categories are all high quality games from top-notch providers such as NetEnt, Evolution Gaming, Play ‘n’ Go and NYX. After clicking on one of the main categories, the game lobby of that particular department will be opened. To aid to efficient navigation, games are then divided in several sub-sections. The Casino category allows you to play all sorts of (video) slots, offering more than 200 unique games. Players who prefer to take a gamble whilst playing against a live dealer will feel right at home in the Live Casino section. We promised always to be honest and we have to admit that the live casino section is not the biggest we’ve seen. Not to fret though, because all major tables such as Blackjack, Roulette and Baccarat are ofcourse available. Furthermore, whilst most online casinoss offer little to no scratchcards at all, PlayClub has a wide variety on offer. Whether you love classic scratchcards or fantasy ones, they have it all. As you can read above, PlayClub has a wonderful game variety. However, this is not the first thing that pops in our mind when we think of the top selling points of the casino. Their reward system is impressive to say the least, and in our opinion the top feature of this casino. First of all, new players receive an interesting welcome bonus. After your first deposit, you will receive a bonus of 100% up to €200 + 100 free spins. PlayClub is the world-class VIP program which consists of a whopping 7 VIP levels: new member, Bronze VIP, Silver VIP, Gold VIP, Platinum VIP, Premium VIP and Prestige VIP. Each level offers outstanding rewards, bonuses and other extras. The 4 upgrades can be reached by collecting the required amount of points. To join the Premium or Prestige VIP club, players will need to receive a personal invite by one of their account managers. Personal account managers are assigned to players with the highest 3 VIP statuses, which will also receive monthly cash back deals. Each time a player reaches a new level they will receive a gift, and unlock all sorts of other cool features. When it comes to rewarding loyal players, there’s really no one like PlayClub. With more than 15 options, PlayClub offers an impressive variety of payment methods. All but one (wire transfer) payment methods ensure instant payment, meaning you don’t have to wait to start the fun and play for real money. Common payment methods such as Card payments as well as several online banking options are available. The full list of options is: VISA/MasterCard, Bank transfer, Sofort, Trustly, Skrill, Skrill 1-tap, Neteller, Giropay, Euteller, Zimpler, Mister Cash, EPS, Wire Transfer, Paysafecard, Instadebit, Entropay and Fast Bank Transfer. PlayClub is the ultimate casino for anyone who wants to be treated like royalty. The more you play – the higher up the VIP ladder you’ll climb where even more special treats are waiting for you. In the time we’ve played at PlayClub we’ve never encountered any real issues, and any questions were always answered swiftly by their friendly support team. What’s not to like? Create an account at PlayClub yourself and check them out yourself.